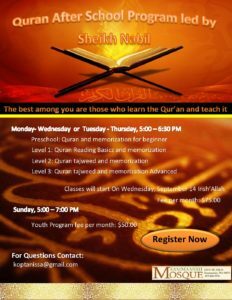 This program focuses on the right way to read the Quran and to memorize it following the steps of the Nooraniyah Qaidah and Ahkam Atajweed. Additionally, the last 30 minutes is dedicated to Islamic studies: prophets stories, Fiqh, Akhlaq (good manners) or Hadith. This program is appropriate for ages 4+. Students will be assigned to the appropriate level based on age and knowledge. Sh Nabil will do the Quran part of the program with Br Abdurrahmane Thuga, focusing on the memorization of Quran and Tafsir. Br Khalid Arisha will do Islamic Studies during the second half of the program. Br. Abdurrahmane Thuga will also do many other activities on various days with the youth such as: basketball, soccer, driving cars and more. This program is led by Sh Nabil and Br. Osama Binziaand. It is a combination of memorization and Tajweed to help adults memorize the Quran with the right pronunciation.